Angry Birds Chrome, like that of the iOS and Android versions, has captured the hearts and minds of players all over the world. The game may not feature the spectacular gameplay of Call of Duty: Modern Warfare 3 or the amazing graphics you will find in Batman: Arkham City , but what it lacks in raw power, it makes up with beautiful simplicity and thrilling fun. Thus, it is no wonder that the game has already racked up millions of downloads on multiple platforms. The key to its success is the fact that it has managed to combine a pleasant puzzle based game with a hilarious plot. Thus, it has arguably managed to pull-off a mini revolution with regards to this genre. One reason the Angry Birds Chrome app has become so popular is because the Chrome Browser, which despite being the new browser on the block, already accounts for more than 25% of all the total browser market. The Chrome web browser is definitely one of Google’s crown jewels and in a short period of time it has managed to evolve into a highly flexible system, offering users a huge variety of customization options. Hence, it is nice to note that Angry Birds Chrome is as smooth and vivid as the chrome browser itself. 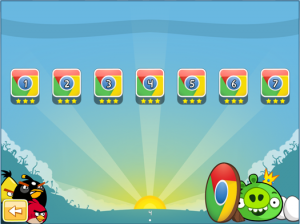 The benefits of Angry Birds Chrome is obvious. First of all, it can be accessed from any PC with an Internet connection and a Chrome browser. This means that you can easily maintain your game even while using multiple PCs in the process. To get the job done all you need to do is follow a couple of simple steps. 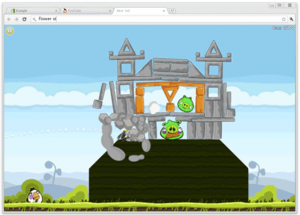 Step 1: Download the Angry Birds Chrome app on to your Chrome Browser. All you need to do is visit the Chrome Web Store and install the app. The process takes a few seconds and you won’t even need to restart your browser, which is something you have got to love about Chrome. Step 2: Synchronize your data (apps, passwords, bookmarks, etc.) by signing in on the particular Chrome Browser. However, be very careful when synchronizing data across browsers. If you are using a laptop or notebook computer in addition to a desktop PC at home, then it would be fine to sync all the data. However, if you are using public computers or computers at work, which might be accessible to others, do not sync critical information like passwords. Always sign-out when you are finished with your secession. Another benefit of playing online is that you will not be constrained by countless pinching and swiping that is necessary with smartphones. Instead, you may well have access to a widescreen monitor, a keyboard and most importantly, a mouse. While this may not be the most mobile way of playing Angry Birds Chrome (even when using a laptop or notebook), it is definitely the most comfortable way to play. 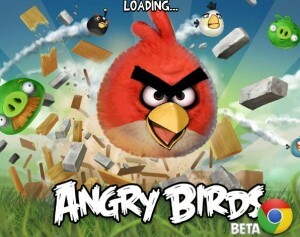 Users who download Angry Birds Chrome can also choose between SD and HD gameplay. Moreover, users will be able to play offline as well. This combination of factors makes the Chrome version one of the best and that appeal is enhanced thanks to the game itself. Despite the fact that Angry Birds Chrome was only recently introduced, it has managed to record more than a million downloads and a “five-star” rating based on more than 35,000 reviews. The basic game features 70 levels. However, in addition to the basic content, users can also gain access to exclusive Chrome dimension levels if the manage to find the Chrome logo in seven different “Poached Eggs” levels. One reason Angry Birds Chrome has managed to remain popular for so long is because it has introduced regular updates that keeps the content fresh and exciting. The latest update, Season’s Greedings, features 25 wintry levels and 3 secret levels. In addition, the game also introduces two web-exclusive levels. The most interesting part of this update, however, is the ability to make an in-app purchase of the Mighty Eagle. This feature was originally exclusive to iOS users but it has since become available on other platforms. The Mighty Eagle, allows users to clear difficult levels and comes with a variety of in-game achievements and goals. However, it will also test your patience because users will only be able to use the Mighty Eagle once every hour. 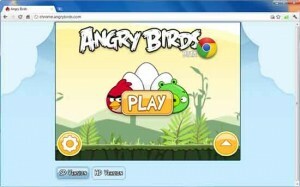 Angry Birds Chrome combines a fine browser with fantastic game. The latest update is bound to enhance the gameplay and the overall fun factor. The additional achievements and levels will certainly make the game look fresh while retaining the originality of the game. The Mighty Eagle update is bound to spark a little friendly debate regarding the gameplay and method of progress but overall, it will prove to be quite fun for those who are stuck at some level. In other words, Angry Birds Chrome is set to thrill yet again.